Cooper, a sweet and loving foster brother and wonderful BBR ambassador passed away at the young age of six after complications following surgery. 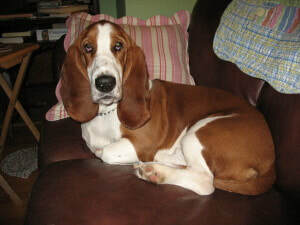 He welcomed all of his basset foster brothers into our home with friendly wags and an open heart. He helped heal broken hearts and wounded souls with a joy for life, puppy-like innocence and a deep and abiding trust in all. He is sorely missed by his BBR rescue sister, Jilly and his mom, Kathleen.